The electroencephalogram (EEG) is a test that has been around a long time. We’ve all see patients hooked to a monitor with multiple electrodes taped to their heads. The EEG records overall electrical activity in the brain and is especially useful in evaluating seizure disorders and sleep disorders. The test is non-invasive- the electrodes are placed on the scalp much like the EKG leads for measuring cardiac electrical activity. 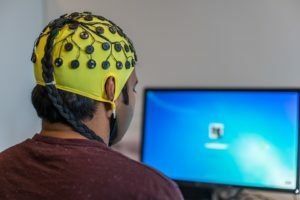 The EEG can definitely be useful in a evaluating patients with an acute concussions where studies have demonstrated disturbance in brain wave activity. However, very few patients with an acute head injury are hooked up to an EEG. It has little practical purpose and the CT scan is used in the emergency setting to detect bleeding. In chronic Traumatic Brain Injury (TBI), especially mild TBI, the EEG is of less diagnostic and prognostic value- these patients often have normal EEGs. In patients who have seizure disorders or specific neurologic findings after TBI, the EEG can be useful and is administered by a neurologist. The problem with the EEG is that it gathers information over a brief period of time while the patients remains still. This is much the same as an EKG and avoids motion artifact. When the patients moves, the electrical activity can be distorted. Over 50 years ago, cardiologists began using holter monitors where patients took a compact EKG monitor home. Electrical activity could then be recorded over a one week period. Intermittent cardiac rhythm disturbances could then be detected and a diary kept to correlate with patient’s symptoms. More recently, ambulatory EEGs have been developed to measure brain wave activity over a 72-hour period, including sleep. Motion activity disrupts accurate brain wave activity and newer technology needed to be developed to filter out this noise. Ambulatory EEGs are now more common and much less expensive than keeping a patient hospitalized for several days. Larger amounts of data must be synthesized to determine if ambulatory EEGs will prove useful in evaluating the individual with chronic TBI. The intermittent symptoms of patients with sub-acute or chronic TBI make these longer-term studies and tracings potentially more meaningful. The closing discussion in this blog is a continuation of the need to collect more data on TBI patients, especially mild TBI. The emphasis and direction of current medical and biological research is based on analysis of mass data. Evaluating individual patients with a head injury has its limits. If a broad-based bank of extended ambulatory EEG results could be collected for thousands of TBI patients, recognizable patterns may begin to emerge. There are a lot of data points, unlike a static MRI or CT scan. It’s not just the EEG that might be useful but long-term tracking of eye movement may also prove valuable. Currently, short-term eye tracking devices are proving helpful in the diagnosis of chronic TBI. These tests require a screen with precise patterns to track eye movement. This is just the beginning- eye movement will need to be tracked over longer term, real-life circumstances. I often hear patients complain after a mild TBI they can no longer focus on a computer screen. They become fatigued and can’t follow the text on the screen. If these patients’ eye movements could be tracked while they were working, a wealth of new data points could be created. If pre-injury tracings of eye movements were stored for individuals on a routine basis, at home or in the workplace, then more accurate comparisons could be made. The privacy concerns of workers would need to be taken into account. Football players are now being given pre-season baseline testing on eye movements to detect future concussions. Traumatic brain injury is a ripe for more broad-based data sets and analysis. The technology must be developed to record long-term brain and vision function that effectively monitor a person’s behavior over a real day or week. One-time snapshots are simply not sufficient in a complex neurologic disease. There are now commercially available eye trackers that look like glasses and could be worn by TBI patients. Eye tracking has been discussed in previous blogs and I use eye tracking in my office. Real world data could be fascinating.